Hello and welcome to my new article, this time I won't give you any deck lists, today I will give you a special edition instead. My personal picks of CBS block uncommons for the deck builder on a budget. Oh, don't forget that do this from my perspective, so don't be sad when I don't mention your favorite toy. You can always tell the audience about it in the comments. Apropos comments, did everyone see the poll I made with my last article? Voting is still open, so go and vote. Well, since the intro is done now, let's begin with the content. We will start with the Champions of Kamgigawa, since... well... that is the first set of the CBS block. Here we have a pretty underrated instant, yes it's 3 mana for 2 damage. But the upside is that you can reuse it, and it is a cheap discard outlet in red. Sure, it is random but it certainly can be abused. I have a deck that I made before TSP became avaiable online that has only this little card as a win condition, it's pretty fun. Not good enough to show it around here, but you might enjoy to build your own deck around this card. You probably already saw this little rat, he is the poor man's reanimator of choice. He is also good in rat tribal decks, but I am pretty sure you already know this. He is also a rogue, am I the only one who likes to build various rogue decks? Try to build one, make a table in casual and tell the room that you use a rogue deck.. could be fun times. Especially when you use the deck in a non-tribal format. This one is also very underrated, the effect is a bit costly, but.. it's an artifact and it can combo with lots of other cards. Especially when you are a johnny. Don't want them to reanimate something? Flashback? Or are you playing singleton and want to show them what a Tunnel Vision really is about? Mindblaze also works. You can find lots of different uses for this one, just look around a bit. This one was huge during his prime, today it is just another budget uncommon. Definitely worth a look for people that like white weenie, samurai or simply dislike graveyards. Hm, is there anything left to say about this one? I can't really tell it's gender, but I guess that is kind of a running gag somewhere else so I should stay away from that joke. Graveyards? Who needs them anyway? And now some honorable mentions, I really like the honden-cycle*, but since they work best when they are all together they didn't make it into the fully commented section. Squelch is a bit narrow but worth a look since it is a cantrip and capable of messing with people's minds Otherworldly Journey almost made it into the list above, yes it is good, get some. Hideous Laughter is also one you should get, sometimes it will be a sweeper and sometimes it will just give you another turn but it's one card you should look at when you are playing black. *Honden of Seeing Winds, Honden of Night's Reach, Honden of Life's Web, Honden of Infinite Rage and Honden of Cleansing Fire. Here we have a fine example of a good flyer, at best they will have to spend two cards to get rid of this one, at worst they will target it with Infantry Veteran before they put it into Temporal Isolation. Give him a try, you might find yourself adding him to all your blue decks. His 4/4 body isn't bad either, he could be the win condition you are looking for. A near unblockable 3 mana, 3 power creature that forces the other players to sacrifice a creature when they want to block. 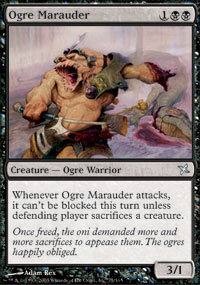 Nice, only the double black mana and his single point of toughness are holding this guy back. Do you want to try to break this one? Against creatureless decks he is less useful, but who plays those these days? He is worth a try, I am still trying to figure out which kind of deck he wants to work with. This is no Gaea's Blessing, but it got one thing that the blessing doesn't have. It's an instant and therefore you can use it as an response. This card can work as hate versus reanimation and flashback, much like Reito Lantern, but it's cheaper and does up to four cards. I use it frequently in lots of different decks, but I am partly Johnny. You might like it when you try it. Don't get between her and her breakfast. Let me show you some more honorable mentions, there is a cycle of Lobotomy-like cards that you might like: Eradicate, Quash, Scour, Sowing Salt and Splinter. 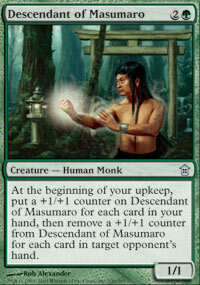 The other uncommon cycle, the genju's are also worth a mention. 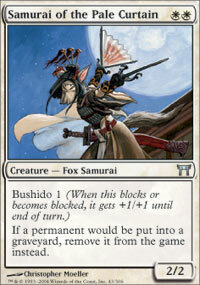 Genju of the Spires was a staple for red decks, maybe it will become one once again after the rotation in 2008. 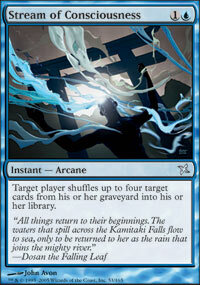 Terashi's Verdict is one of the few white instant removal spells. 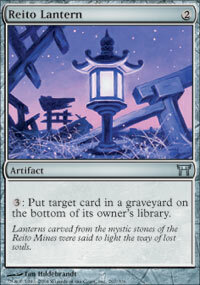 Oh, and Soratami Mindsweeper is a lot cheaper then Whetwheel. *Genju of the Fens, Genju of the Spires, Genju of the Falls, Genju of the Cedars and Genju of the Fields. Insert somewhat witty comment here. Ah, the joys of wisdom. This monk is a puzzle to be solved. Can you do it? I tried. Sometimes it works, sometimes it doesn't. Luckily he only needs 1 colored mana. Discard or card draw, which way do you choose? Of course there is always an FFA waiting for him..
6 mana for 9 power, good. Haste, also good. Tokens, nice. But... you only have them for one turn. Can you say "No." to little lightning tokens? I like them, mostly because non-green tokens have a place in my heart since Goblin Scouts was printed. The surprise factor of this one is also nice. Since it's a sorcery it is also compatible with Anarchist. Give it some love. No Umezawa's Jitte for you. The anti-equipment equipment, you know that you will want something like this when your opponent shows you Umezawa's Jitte or Sword of Fire and Ice. This one will get better with every problematic equipment that gets printed. 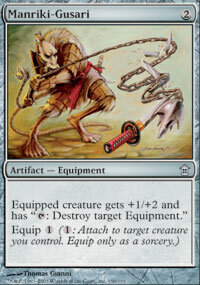 Or reprinted, like Loxodon Warhammer. What are you waiting for? I am pretty sure that no one will regret owning a playset. This one is a 4 mana 4/4 flyer. At least when you have more cards then the other guy. But since you are playing blue.. that shouldn’t really be a problem. 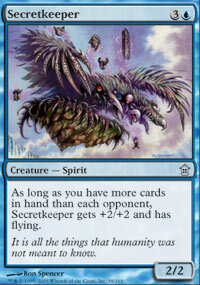 Flying creatures are usually a good win condition. Hm, what can I say about him in addition to the obvious? Not much, I guess you will have to try him out. More honorable mentions, the cycle of channel-spirits* is pretty good for tribal. AJ_Impy already mentioned them in one of his articles. 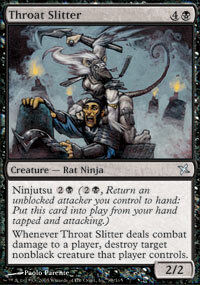 Shape Stealer is one of the unusual shapeshifters that you might want to build a deck around. 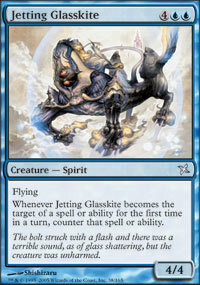 The onna-cycle* is also pretty interesting if you want to do a spirit-themed deck. *Ghost-Lit Nourisher, Ghost-Lit Raider, Ghost-Lit Redeemer, Ghost-Lit Stalker and Ghost-Lit Warder. *Yuki-Onna, Nikko-Onna, Haru-Onna, Kemuri-Onna and Kiri-Onna. Well, looking back at what I wrote this seems like a pretty short article, but it's a special. I hope it is good enough, speak up if you want to see me do something like this again. I really need some more feedback and some additional votes in the poll from last time would help too. I need to know what you folks want to read, I can't just guess what formats you readers like. Why I choose certain cards.. I mentioned cards that I enjoy, and as a major criterium cheap cards. Since.. it's about budget uncommons, and if you read my other articles you might see that for me that most often means cards in the 5 cent range. Most of the spirit & arcane cards are surely fun and usefull, I have several decks that use cards you mentioned, but they need specific decks to run smoothly. My picks are for a broader usage. And regadring the streams.. I often use them. 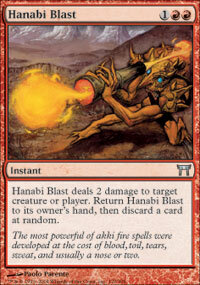 Beeing an instant and a relative cheap shuffle/restocking effect got something to do with that. 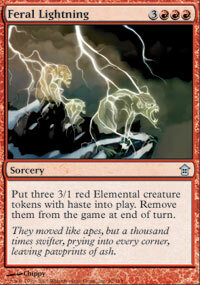 The lightning as stated above is simply fun and deserves it's place in my eyes because.. it makes red tokens. Secretkeeper.. you mentioned wisdom-based decks, he is one of the overlooked wisdom cards, and he is fun to use, especially along some of the soratami or sweep-cards. Time of need, thief of hope, the 2 netsuke, footspeps of goryo, hana kami, hinder, lure, mark of sakiko, the entire oni brigade (a deck oni+ ogres-as the marauder you've written about- can be a real pain for your enemy: fast and powerful), o naginata, overwhelming intellect, reciprocate, sire of the storm (in the good deck = infinite cards), soilshaper (the best card for land destruction :) ), sosuke summons, seek the horizon. I really think that the cards you've picked are powerful, but i can't understand what do you think is good in secretkeeper, feral lightning and stream of consciousness... the second 2 cards are really overcosted. However i was happy to read about kamigawa, it's the block i prefer, it was balanced (except kokusho and some other cards) and powerfu. If those are the "best" or most "interesting" uncommons frm Kamiga block I'm ery glad I skipped it. When they anounced they did a Oriental Based block I thought it would be cool, but imho it simply didnt work out great. Too much Spiri/Arcane stuff ( which really messes up Momir) and overal bad cards. Those are the more interessting budget uncommons, in my opinion. .... to get people to actually look at that poll? I really need some more feedback on what you want to see. I got a nice Rogue deck too, i love building weird tribal decks like Sphinx. 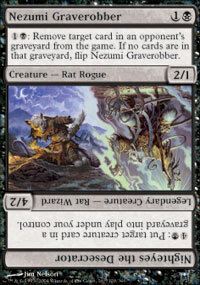 But i dont use graverobber in my rogue deck, might need to add him in.